A few weeks ago, I got the itch to bake something fall-ish. I perused my ever-growing list of saved recipes, and I happened upon this one that I starred, oh about a year ago. 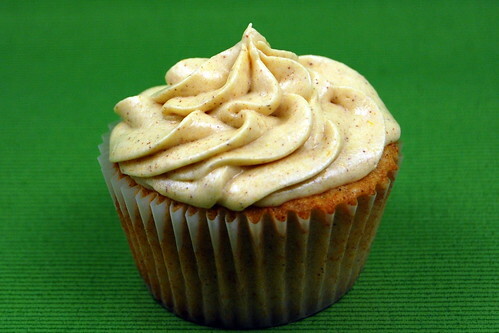 These cinnamon cupcakes are warm, sweet, and well, cinnamon-y. Even my picky-about-dessert husband really liked these. I made just a few changes from Annie's version - adding a pinch of nutmeg, and I omitted the orange zest because I didn't have any. I also changed the frosting from cream cheese -cinnamon frosting to cream cheese-cinnamon-pumpkin frosting. Delicious! This a perfect fall dessert. Make them soon, you won't be sorry! Preheat the oven to 350. Line a 12-cup cupcake pan with liners, and spray with cooking spray. Sift together the flour, baking powder, cinnamon, nutmeg, and salt. Melt the butter and combine with buttermilk. Set aside. In the bowl of a stand mixer fitted with the paddle attachment, cream the sugar and eggs until a thick batter forms, about 5 minutes. Beat in the vanilla and orange zest, and mix until combined. Mix in the flour mixture until just combined, and then do the same with the butter and milk mixture. Fill each cupcake liner 3/4 full, and bake 15-18 minutes, or until a toothpick inserted in the center comes out clean. Allow to cool in the pan for 5 minutes, then transfer to a wire rack. Cool completely before icing. Cream the butter, cream cheese, and pumpkin together in a stand mixer until well combined and very smooth. Add the vanilla and cinnamon and mix until well combined. Slowly add the powdered sugar, about 1 cup at a time, until desired consistency and sweetness is reached. Frost the cooled cupcakes. I'm going to add this recipe to my "ever-growing" list. These look delicious! Cream cheese pumpkin icing sounds delicious! I love your blog! I've been in the mood for something fall too. Do you have any suggestions for a good apple cider? Hi, my name is Grace and I'm a journalist for a student-run magazine at the University of California, Berkeley. We are doing a piece on healthy eating and your picture of Poached Salmon with Corn and White-Wine Butter Sauce fit perfectly with one of our segments. I would like to know your statement on photo usage, and if it'll be okay for us to use the image. Your website will be credited. Thank you for your time. I have never made apple cider, but I do like Trader Joe's. If you have a local orchard nearby, they would probably have the freshest option! 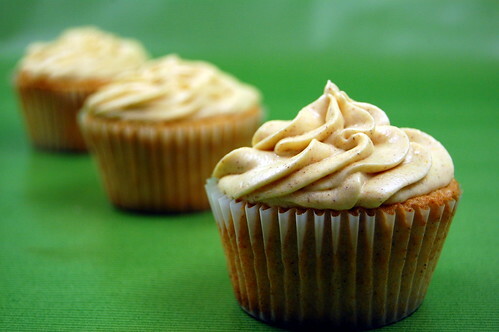 This pumpkin frosting sounds amazing! I think I need to add this to my list of desserts to make at some point this week. Thanks for sharing!